Refresh and revive skin gently with exfoliating body scrubs. Whether skin is breakout-prone or aging, hyper-pigmented, or dry and dehydrated, exfoliation is essential for resolving all problem skin conditions. Exfoliation stimulates cell renewal rates to brighten skin, improve skin texture, and help reduce the signs of premature aging. At Makes Scents Natural Spa Line, we carefully formulate our natural spa products to exfoliate & moisturize skin, leaving it silkier and smoother than it has ever been before. We use exfoliants derived from nature, including organic sugar, Israeli Dead Sea, Himalayan and Mediterranean Sea salts. Combined with essential and aromatic oils, they leave your skin soft, smooth, and rejuvenated. We also use other natural exfoliants including coffee beans, poppy seeds, dried lavender buds, lemon peel, pumpkin, and luffa—all of which provide luxurious exfoliating properties. All of our body scrubs are vegan and certified cruelty free by the Leaping Bunny Program. Browse our selection of natural body scrubs to discover which line will best complement your spa treatment menu. And contact us about creating a custom body scrub formulation for your spa or resort. Our scrubs are available in 7 oz. to 8.5 oz. retail jars and professional sizes, including gallon and half gallon containers. For professional spa product pricing, connect with us by phone at 717-824-3094 or by email at Info@MakesScentsSpaLine.com. Restore balance to your skin with this all-natural, soothing scrub. With natural exfoliants including organic sugar, and luffa fruit powder, Balance Body Scrub rejuvenates dull, dry skin. Organic sunflower seed oil nourishes and soothes while vitamin C-rich orange peel stimulates circulation. As the soft scent of lavender oil calms and relaxes the mind, this scrub softens skin, and eases inflammation with orange, pink grapefruit, and patchouli oil. Reveal healthier, more balanced skin with Balance Body Scrub. Best used along with Balance Body Wrap (professional use only) and Balance Body Butter. Chai to Resist Body Scrub embodies the virtue of purity while delivering a decadent experience. 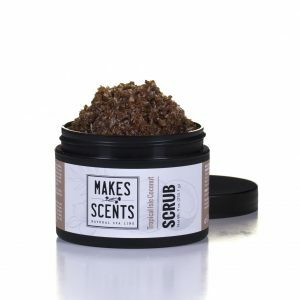 This 100% natural scrub is made with certified organic ingredients including sugar, black tea, sunflower seed, and safflower oil to exfoliate and renew parched, rough skin. Its powerful essential oils, including cinnamon and clove, increase circulation and flush out toxins. Together these powerful ingredients support the skin’s own cell renewal process, and assist in creating smooth, hydrated skin. Best used along with Chai to Resist Body Butter. Envelop yourself—mind, body and senses—in the alluring aroma of pure chocolate with this extraordinary, 100% natural and organic body scrub. Chocolate Decadence Body Scrub is made with real organic cacao powder, which contains antioxidant and anti-inflammatory properties. Organic cocao butter, sunflower seed, and safflower oil soothe skin while organic sugar and cacao beans exfoliate to soften and brighten skin. Indulge in the delicious, skin-hydrating experience of Chocolate Decadence Body Scrub. Best used along with Chocolate Decadence Body Wrap and Chocolate Decadence Body Butter. Energize your body and mind with the sweet, fresh scents of grapefruit, lemon, lime, and orange. Citrus Grove Body Scrub exfoliates and softens dry, rough skin with pure organic sugar while bioflavonoids, found in citrus fruits, fight skin-damaging free-radicals. Citrus fruits contain alpha hydroxy acids which provide mild exfoliation, while citrus essential oils purify the skin and balance and uplift the senses. Rejuvenate, soften and restore the natural glow of youthful skin with Citrus Grove Body Scrub. Best used along with Citrus Grove Body Butter. Restore your skin’s natural radiance and clarity. Clarify Body Scrub uses Mediterranean Sea and Israeli Dead Sea salt to exfoliate and reveal refreshed skin. As rosemary oil fights bacteria and improves circulation, vitamin-rich organic sunflower seed oil nourishes the skin. Clarify Body Scrub also benefits skin with the anti-inflammatory, antiseptic, and uplifting properties of peppermint, spearmint, and thyme. Protect and replenish your skin with Clarify Body Scrub. Best used along with Clarify Body Wrap (professional use only) and Clarify Body Butter. Picture yourself in a tropical paradise as our Coco Mojito Sugar Scrub hydrates your dull, tired skin and fills your senses with the refreshing scents of lime and peppermint. Organic cane juice (a natural alpha hydroxy acid), lime peel, peppermint leaves, and organic raw coconut gently exfoliate and soften skin, leaving it silky smooth and refreshed. This all-natural scrub also has lime essential oil, which acts as an astringent to tighten and firm skin as lime extract helps lighten hyperpigmentation. With high levels of tocopherols and tocotrienols (two forms of antioxidant vitamin E) in safflower and rice bran oil, Coco Mojito Sugar Scrub also helps slow the formation of wrinkles. Reveal more vibrant, younger-looking skin with this intoxicating, island-inspired scrub. Best used along with Coco Mojito Body Wrap (professional use only) and Coco Mojito Body Butter. Re-establish your skin’s original glow with Cranberry & Soy Body Scrub. Organic sugar, along with cranberry and soy seeds, combined in a base of organic sunflower seed oil, organic safflower oil, and shea butter, form a hydrating, and skin-softening body scrub. Anti-aging properties contained in cranberries, such as vitamin A and C, reduce fine lines and firm the skin. Brighten dull, dehydrated skin with Cranberry & Soy Body Scrub. Best used along with Cranberry Hydrating Gel Body Wrap (professional use only), and Cranberry Spice Body Butter. Available October 1 – December 31. Indulge your body in the sweet, sinful scent of rich caramel without the calories. Dulce de Leche Body Scrub exfoliates and hydrates dry, rough skin with organic sugar, and natural moisturizing properties found in coconut milk. Agave nectar works to stimulate the natural synthesis of hyaluronic acid, thus producing hydrated, softer and smoother skin. Rejuvenate, soften and restore the natural glow of youthful skin with Dulce de Leche Body Scrub. Best used along with Oatmeal & Vanilla Body Wrap (professional use only) or Chocolate Decadence Body Wrap (professional use only) and Chocolate Decadence Body Butter. Rouse your senses and renew your dull skin with Invigorate Body Scrub. Pure Mediterranean Sea salt and Israeli Dead Sea salt, along with luffa fruit powder, gently exfoliate to reveal fresher, more vibrant skin. Organic sunflower seed oil, lavender, and clary sage oils soothe body and mind as lemon peel and oils of rosemary and cajeput heal and improve skin clarity. Invigorate Body Scrub also helps protects skin from environmental damage (including UV rays) with the powerful antioxidant, vitamin E. Prepare to show skin that glows with Invigorate Body Scrub. Best used along with Invigorate Body Wrap (professional use only) and Invigorate Body Butter. Just as your mind is energized with the aroma of freshly brewed coffee, so too is your skin rejuvenated as your body is enveloped in freshly ground coffee beans and sea salt. Natural ingredients such as Israeli Dead Sea and Mediterranean Sea salt, organic sunflower seed oil, along with freshly ground organic coffee beans, provide skin-softening effects. Coffee, a natural stimulant, also improves microcirculation, reduces swelling, flushes away toxins and delivers oxygen and nutrient-rich blood to the surface of the skin. Stimulate and energize your mind and body with the Java Junkie Body Scrub. Best used along with Oatmeal & Vanilla Body Wrap (professional use only) and Java Junkie Body Butter. Indulge in the tantalizing aroma and cooling sensation of Peppermint Swirl Body Scrub. Made with certified organic sugar, sunflower seed and safflower oil, this all-natural scrub nourishes and hydrates the skin. The stimulating effects of peppermint oil, increase blood circulation, which gives skin a luminous, healthy glow. Peppermint Swirl Body Scrub gently exfoliates the skin and flushes away impurities, leaving your skin radiant and your senses refreshed! Best used with Peppermint Swirl Body Butter. After a summer of fun-in-the-sun, we are, at times, left with dull, sun-damaged skin. Restore your skin to the glow it once had with an autumn-inspired pumpkin body scrub. Naturally high in vitamin A, C, and zinc, pumpkin renews the radiant luster of youthful skin. Pumpkin also soothes sensitive skin, and acts as a carrier, assisting other nourishing ingredients to absorb deeper into the skin, intensifying the results. Pumpkin, organic sugar, and organic sunflower seed oil work together to diminish the effects of the summer sun and reestablish radiant, soft skin once again. Best used along with Pumpkin Crème Brûlée Body Wrap (professional use only) and Pumpkin Mousse Body Butter. Available September 1 – November 30. Picture yourself relaxing to the sound of ocean waves breaking on the shore as you gently exfoliate your skin with this sea-inspired salt scrub. Made with 100% pure Israeli Dead Sea and Mediterranean Sea salts, this scrub delivers healthful minerals while it sloughs away dull, tired skin. Luffa fruit powder, soy seeds, and lemon peel also come to the rescue of dry skin. This scrub also has fir needle essential oil and organic sunflower seed oil to help firm the skin as bergamot and frankincense soothe and heal. Satiate your skin and set your senses free with Sea Sanctuary Body Scrub. Best used along with Sea Sanctuary Body Wrap (professional use only) and Sea Sanctuary Body Butter. Embrace the arrival of autumn with our all-natural Spiced Orange Cider Body Scrub. As organic sugar and orange peel gently exfoliate, essential oils of orange, cardamom, and cinnamon nourish and detoxify skin. This scrub also has vitamin-rich organic sunflower seed oil and vitamin E, which help fight free radicals and protect against damaging UV rays, pollutants, and the effects of aging. Revive and restore the natural glow of healthy skin with this enticing and aromatic scrub. Best used with Spiced Orange Cider Body Butter. With the alluring scent of succulent, sweet strawberries, our Strawberry Fields Body Scrub will envelop your senses as it exfoliates and softens your skin. Using organic sugar combined with organic strawberries, this scrub bursts with skin rejuvenating goodness. It’s packed with vitamin C and polyphenols that help fight signs of aging. Plus, strawberries’ natural salicylic acid gently exfoliates and sloughs away dead skin cells. Ready for skin that’s softer, smoother, and deliciously glowing? Indulge in Strawberry Fields Body Scrub. Best used along with Strawberry Fields Body Butter. Coordinating body wraps (professional use only) include Chocolate Decadence Body Wrap or Oatmeal & Vanilla Body Wrap. Fun in the warm summer sun can wreak havoc on delicate skin. Treat your sun-damaged skin to the ultimate summer body treatment that dramatically smoothes, polishes and energizes skin. Tropical Isle Coconut Body Scrub contains 100% pure coconut, nothing more, nothing less. Organic coconut palm sugar, made from the sap of the coconut palm tree, along with organic raw coconut and ground coconut shell, gently exfoliates while organic virgin coconut oil hydrates and protects the skin. Coconut oil not only relieves dry, sun-damaged skin, but it aids in healing and repairing as well. Give your skin a new, fresh look and feel with Tropical Isle Coconut Body Scrub. Best used along with Chocolate Decadence Body Wrap (professional use only) and Tropical Isle Coconut Body Butter. 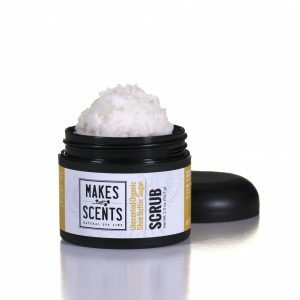 Makes Scents Natural Spa Line’s Organic Shea Butter Sugar Scrub is 100% natural, organic, and vegan, and it leaves no residue behind after it’s removed with steamed towels. Featuring organic shea butter, organic sunflower seed oil, and organic evaporated cane juice crystals, it gently exfoliates, leaving skin soft, smooth, and glowing. For professional spa product pricing, connect with us by phone at 717-824-3094 or by email at Info@MakesScentsSpaLine.com. For more information on our retail essential oil blends, please visit our Essential Oil Blend tab on our online store.